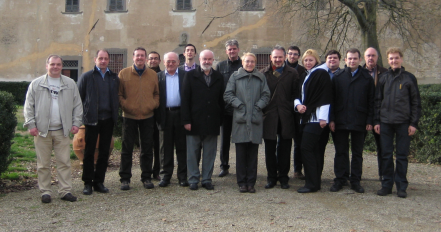 The fourth project progress meeting was held on 20-21 January 2011. The meeting was hosted by the European project partner UFL - Research Centre for Renewable Energy (CREAR) of the University of Florence based in Florence, Italy. Meeting participants (from left to right) : Maxim Glushenkov (ECT), Alexander Kronberg (ECT), David Chiaramonti (UFL), Alejandro Alcala (UAS), Valeriy Kirillov (BIC), Andrea Maria Rizzo (UFL), Tony Bridgwater (UAS), Bert van de Beld (BTG), Virginie Rimbert (EC), John Vos (BTG), Matteo Prussi (UFL), Tatyana Polyanskya (BIC), Nikolay Khripach (NAMI), Lev Lezhnev (NAMI), Jan Florijn (BTG), Martin Sprenkler (ECT).